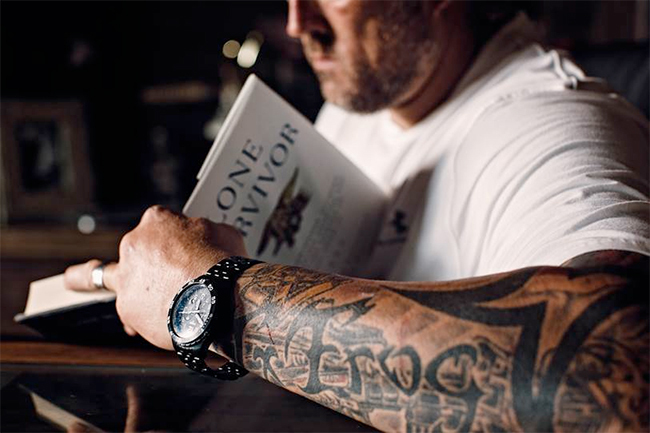 Traser, the leading brand in self-illuminated tactical watches, is proud to announce a partnership with a true American war hero, Marcus Luttrell. Marcus is a former United States Navy Seal, who has been honored as a recipient of the Navy Cross and Purple Heart for his actions during Operation Red Wings in Afghanistan. This operation, fought against seasoned Taliban fighters, proved to be dangerous and deadly for the Navy Seals. It gave birth to the book “Lone Survivor”. Marcus Luttrell and Traser have many common values. They share principles such as perseverance, precision, reliability, & the goal to never quit under adverse conditions. Traser will continue to design and manufacture watches with specific significance to our tactical culture; while addressing the essentials of a timepiece with focus on durability, strength and clear vision in night time and extreme conditions. Marcus Luttrell stated, “I admire the functionality, the legibility in darkness and the ruggedness of this special timepiece.” His current favorite is the P66 Mil-G.
Marcus will actively endorse Traser and help bring the brand, its technology and benefits closer to the tactical community. A Marcus Luttrell Special Edition timepiece is planned for later this year. Traser watches are featured on the hit CBS TV show, SEAL TEAM. This military drama follows the professional and personal lives of the most elite unit of Navy SEALs as they train, plan and execute the most dangerous, high stakes missions our country can ask of them. * nanocandela (after 1 hour) beta-decay. Mention radioactivity and the image of men in orange radiation protection suits holding geiger counters may come to mind. However, many industries are making good use of radioactive isotopes and in the process, are saving lives in the medical arena and/or manufacturing products containing the mb-microtec GTLS (gaseous tritium light source)- illumination technology powered by the decay of tritium. Tritium is a heavy form (isotope) of hydrogen and for this reason behaves chemically exactly like it. Pure tritium therefore, forms a gas T2 (like hydrogen forms H2).However, tritium is not stable but decays to the inert gas helium with a half-life of 12.3 years. This means that after this time half of any amount of tritium will have become helium. This transformation process is called a pure beta-decay. In this process no gamma radiation occurs and only a low energy electron is emitted. What are the risks of using Tritium in a GTLS? None. The low energy electrons of tritium cannot escape the glass body of a mb-microtec trigalight (tradename). Only the rupture of such a light source would free the tritium gas and it would quickly disburse. A typical traser® H3 watch contains anywhere from 15 to 20 mb-microtec trigalight for a total of no more than 25 millicuries. On a yearly bases, the wearer of such a watch must figure on an additional exposure of 0.1 micro sievert, which is about equal to the increase the human body would absorb due to cosmic or random radiation, by living an additional 12 inches above sea level. This 0.1 microsievert is also about 30’000 less than the average yearly exposure due to that same background radiation. Now, lets assume that in a closed, unventilated room all the GTLS of 40 such watches (also 1000 millicuries or 600 to 800 GTLS) would simultaneously burst open and release their tritium gas, the resulting exposure to a person in that room would still be only about 50% of the yearly, random background exposure that every living creature on earth is exposed to. This example, as unlikely as it may seem, serves well to illustrate the scientific facts about this technology and further demonstrates the safe nature of this product. If the luminous markings on a watch are reasonably sized and arranged, the readability in the dark is primarily determined by their total light emitted. In order to assess the relative merits, the light intensity of two dials with identical markings by mb-microtec trigalight ( traser® H3-watch ) on one and SuperLumiNova on the other, were measured and compared. The results, with the light intensity expressed in the unit “nanocandela” (ncd) are given below. The conclusions are plain: LumiNova provides limited night reading capability whereas Traser® H3's permanent and constant illumination provides safe, unfailing and unlimited night time readability.